Coca-Cola has apologised after an online ad for Sprite prompted social media accusations of sexism. 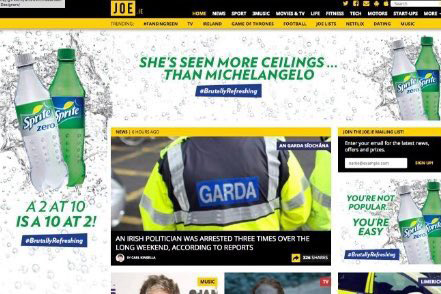 Banner ads and a homepage takeover on Joe.ie carried the slogans "A 2 at 10 is a 10 at 2!" and "She’s seen more ceilings than Michelangelo". The ads prompted a flurry of angry comments on Twitter, with many saying the Coca-Cola-owned lemonade brand had debased its #BrutallyRefreshing hashtag, which describes uncomfortable truths. Paddy McKenna, the editor of Joe.ie, responded to a Twitter user and said the ad "shouldn’t have been there and has since been removed." Sprite: "We'd like to aim our product at a misogynistic audience." In a statement, Coca-Cola said: "We're sorry for any offence caused by the #BrutallyRefreshing Sprite campaign in Ireland, which was intended to provide an edgy but humorous take on a range of situations. "Since its introduction in Ireland, Sprite has been associated with individuality and self-expression and we have always been committed to ensuring we deliver the highest standard of advertising. "We recognise that on this particular occasion the content did not meet this standard and we apologise. The campaign has now come to an end and the advert in question will not appear again." @Sprite how many ceilings has Michelangelo seen? I want to know now.